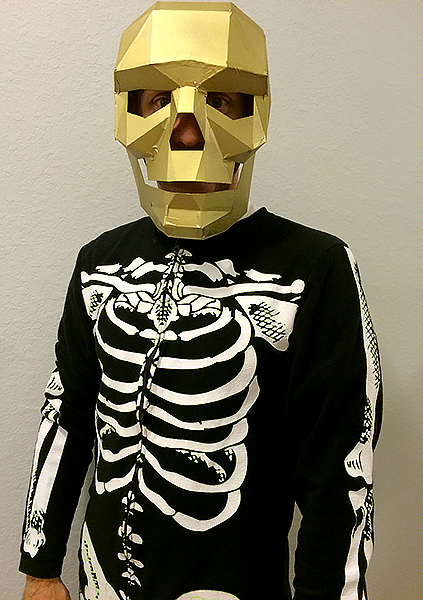 I got these cool plans off of etsy on how to make a paper geometric sided skull mask. For about $8 I got the digital plans. You can get them here along with plans for other masks (search for the skull). I glued the paper printouts to the card stock with the spray matt and let it dry for about 2 hrs. After that I began the cutting and creasing which took the most time. Assembly with the tape took about another hour. I taped inside and out. Next up was busting out the gold spray paint and giving it a good 2 coats. One thing I learned is doing this the night before it’s needed is NOT recommended as you be up late into the wee hours of the morning. Not fun. This really is a 2/3 day project to really do right. Final look along with the rest of my costume. 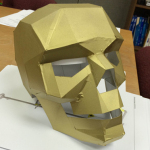 The skull ended up reminding me a bit of Skeletor from the 80’s tv cartoon He-Man and the Masters of the Universe.